The rate in which a light beam bends when entering or exiting a clear liquid depends on the refraction index of that liquid. 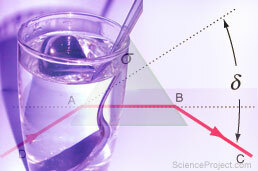 Refraction index varies among different liquids and for solutions, it also depends on the density or concentration of the solution. Refractometer are used to measure the refraction index of liquids and used to determine the concentration of solutes in a solution. In this project we will test to see if the temperature is a factor affecting the refraction index and if the refraction can be used to determine the temperature of known liquids. In this project you will make a simple refractometer and use it to observe the refraction angle of a light beam while passing through a specific liquid (such as water) at different temperatures. This is a quick project and you can complete your experiments in one day. Material that you may have to buy may cost about $20.00. More details or support on this project is available for the members of ScienceProject.com. Material needed for experiments may be found locally or purchased online from MiniScience.com.